The summary report for policy makers from the latest IPCC Working Group 1 report was released a few hours ago, at 10:00 am this morning Stockholm time. For the last five days the IPCC has been meeting to consider and finalise the draft report. By all accounts it was a mammoth session, with participants working around the clock. If nothing else, it shows that all the participants took the summary report very seriously. I watched the live telecast and have skimmed the Summary for Policy Makers. It's only 36 pages from beginning to the figures and tables at the end. During the telecast, tabloid writer David Rose asked a question and was told by Michel Jarraud of the WMO that from a scientific point of view it was "an ill-posed question" based on a misunderstanding of how models work. Good for Michel Jarraud! How much more can we burn? One figure that stood out was a plot of temperature against cumulative CO2 and cumulative carbon. I was going to include the full caption but it's long. Scientists don't make things simple to follow, do they. You can read the caption at the top of page SPM-20 here. Click image for larger version. Figure SPM.10: Global mean surface temperature increase as a function of cumulative total global CO2 emissions from various lines of evidence. I think that translates to - don't burn any more than 800 Gt of carbon if you want to leave any sort of future for humankind. Over the last two decades, the Greenland and Antarctic ice sheets have been losing mass, glaciers have continued to shrink almost worldwide, and Arctic sea ice and Northern Hemisphere spring snow cover have continued to decrease in extent (high confidence). The atmospheric concentrations of carbon dioxide (CO2), methane, and nitrous oxide have increased to levels unprecedented in at least the last 800,000 years. CO2 concentrations have increased by 40% since pre-industrial times, primarily from fossil fuel emissions and secondarily from net land use change emissions. The ocean has absorbed about 30% of the emitted anthropogenic carbon dioxide, causing ocean acidification. Human influence on the climate system is clear. This is evident from the increasing greenhouse gas concentrations in the atmosphere, positive radiative forcing, observed warming, and understanding of the climate system. Climate models have improved since the AR4. Models reproduce observed continental-scale surface temperature patterns and trends over many decades, including the more rapid warming since the mid-20th century and the cooling immediately following large volcanic eruptions (very high confidence). Changes in the global water cycle in response to the warming over the 21st century will not be uniform. The contrast in precipitation between wet and dry regions and between wet and dry seasons will increase, although there may be regional exceptions. The global ocean will continue to warm during the 21st century. Heat will penetrate from the surface to the deep ocean and affect ocean circulation. Cumulative emissions of CO2 largely determine global mean surface warming by the late 21st century and beyond. Most aspects of climate change will persist for many centuries even if emissions of CO2 are stopped. This represents a substantial multi-century climate change commitment created by past, present and future emissions of CO2. One delegate told the Telegraph on Thursday night: "The good news is that the Saudis are not objecting to every word like used to happen [at previous meetings]. He said: “The risks and costs of doing nothing today are so great, only a deeply irresponsible government would be so negligent. The new Intergovernmental Panel on Climate Change report should be a game-changer in how Australia tackles global warming. But it won't be - not without strong leadership from Prime Minister Tony Abbott. Future generations will look back, see the clear evidence of human-induced climate change in this and previous IPCC reports and wonder why more wasn't done sooner to tackle the problem? They will look at the safety-first approach of the Howard Coalition government on, say, terrorism, where substantial policy, investment and cultural change was implemented to minimise that risk. Why, they will ask, does this Abbott Coalition government at best play down the risk of global warming and at worst deny it to protect vested interests and reinforce the ideological groupthink among its cheer squad? Read the full SMH editorial here. In the United States, officials reacted favorably to the report. Secretary of State John Kerry said “climate change is real,” happening now, and that the United States is determined to be a leader in curbing emissions. Sen. Barbara Boxer (D-Calif.), chair of the Committee on Environment and Public Works, called the report a landmark and said it underscores the administration’s recent efforts. “I will do everything in my power to support the administration in their efforts to address the dangerous impacts of climate disruption,” Boxer said. Frances Beinecke, president of the Natural Resources Defense Council, an environmental advocacy group, called the report “a warning bell to the world.” She said the impact are fierce wildfires, drought, floods and storms that will only get worse with delay. “The science is clear: We are altering the climate,” Beinecke said. Read the full Washington Post article here. There's a miscellaneous collection of news items, newspaper blogs and editorials here on Google news. Mainstream media is doing straight reporting. I'd say if you want to read what science deniers are saying you'll have to go to their blogs, because they don't seem to be getting much airplay in the news. That IPCC had a golden opportunity, and blew it due to being unable to adapt to reality. He didn't say what he thought the "golden opportunity" was or how the IPCC "blew it", only why. Anthony promised a "bullet point collection" of reactions as they come in, but he left out the bullet points. There is not a dot to be seen at WUWT. As for reactions, Anthony did report that Judith Curry went looking through the summary report for her favourite "uncertainty". Going by what I've read she will be certain to have found less uncertainty than was in previous IPCC reports. Therefore it is extremely likely that Judith Curry won't be happy (high confidence). The reaction from the rest of what Anthony has collated is predictable and boring. The usual "I don't believe it" and "all the world's experts are wrong" mixed in with mostly non-specific grumbles and moans. The comments are archived here with Anthony Watts bullet-less bullet points. They just keep running for the shelter of their old pal CO2. It’s tiresome. Just heard Prof Bob Carter on BBC Radio4 World at One. Brilliant interview putting a sound sceptical perspective on the IPCC report. Well worth a listen again when it is available. SPM in a nutshell: Since we started in 1990 we were right about the Arctic, wrong about the Antarctic, wrong about the tropical troposphere, wrong about the surface, wrong about hurricanes, wrong about the Himalayas, wrong about sensitivity, clueless on clouds and useless on regional trends. And on that basis we’re 95% confident we’re right. We should just be pointing out the errors now. There is no point discussing the virtual world the IPCC is talking about – they are not talking about the real planet Earth, but some virtual world, planet Nibiru in a climate model. One major graphic is clearly wrong. The observed change in temperature from 1901 to 2012 – figure SPM.1 (b), particularly the Oceans part. There has been no warming in the central Pacific but it is shown as +0.4C or so in the graphic (large parts of it not shown despite there being a large number of measurements in this region covering the whole period). There has been no warming in the far southern ocean (again it is missing despite a large number of ships being there over the whole period – including whaling ships in the early part of the 20th century). Other areas have no warming over this period yet the entire Ocean area is shown as having warmed. Clearly the Figure is meant to show warming everywhere yet that is not correct. 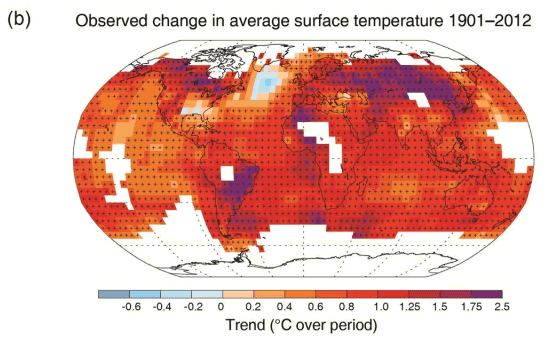 The graphic showing observed change in temperature relative to the climate models shown in earlier drafts is not included in the report anymore. Bill provides no evidence of why he thinks the chart is wrong. I'm going to go with the science rather than a WUWT regular. In the MSM (BBC, CNN, etc) the IPCC report is being portrayed as the gospel truth on climate change. For example the CNN summary is “The world’s getting hotter, the sea’s rising and there’s increasing evidence neither are naturally occurring phenomena”. I think it’s fair to say that the MSM are onside with the warmists. The online debate is not reaching the consciousness of the general public. The BBC are all over it today, of course. Fawning interviews with the IPCC crowd to spread their political message and – a new development! – the occasional few words from the likes of Bob Carter, now being allowed as the “minority view” to give the impression of balance. Overall, exactly as you’d expect from “The World’s Most Respected Broadcaster” (© BBC): junk reporting of junk politics. I, meanwhile, remain unshaken and unstirred. Nobody has yet produced any evidence (that I’ve been able to find) to suggest that humanity has had any effect, still less a “catastrophic” one, on the world’s weather systems, therefore the null hypothesis holds. Still waiting, guys. Show me how evil we are, rather than how evil you are. The sad part is most of the policy makers that will read this are going to fall for it. How long can this lie last and will anyone be held accountable when the jig is up? Realistically, anyone who wants to address concerns and uncertainties with the science shoudl wait for the technical reports. But that's not how deniers work. You're right, Dennis. The deniers started complaining about the report a few weeks before it was released. Papers like the Mail, Telegraph and Australian were even making up stuff.